Stanislaus de Lazovert was born in Poland. He moved to Russia and during the First World War he met Vladimir Purishkevich while he was in charge of a medical aid train on the Eastern Front. In 1916, Purishkevich, the leader of the monarchists in the Duma, recruited Lazovert, to muder Grigory Rasputin. Other members of the conspiracy included Prince Felix Yusupov, Grand Duke Dmitri Pavlovich Romanov and Lieutenant Sergei Mikhailovich Sukhotin, an officer in the Preobrazhensky Regiment. As he seemed to be disappearing in the darkness, Purishkevich, who had been standing by, reached over and picked up an American-made automatic revolver and fired two shots swiftly into his retreating figure. We heard him fall with a groan, and later when we approached the body he was very still and cold and - dead. the house of Prince Yusupov... There some bottles of port and madeira specially prepared for him were set out. The wine had previously been tested upon one of the dogs that infest the courtyards of Russian houses, and the dog had died almost immediately. Rasputin drank altogether six glasses without any apparent effect, and his companion became persuaded that this sinister, herculean monk was under satanic protection. Making some excuse, he climbed the winding staircase to the room above, where his companions were assembled, and returned to the room with a revolver which they lent him. He found Rasputin leaning on his hands, and puffing as if he was not feeling well. Presently he staggered to his feet and went over to an icon. At that moment while he was standing before the icon the pistol was fired. He uttered a great cry and tell backwards on the floor. On hearing the shot those who were waiting upstairs came down with a doctor, who examined the wound and pronounced life extinct. They then went awav to make arrangements about the removal of the body, but one of them came back after a few minutes to make sure that he was really dead, for they all seemed to have believed that a satanic power had given him superhuman strength. The pulse was not beating. The man drew aside the monk's habit to feel the heart, and at that moment Rasputin with a terrible cry seized him by the throat. There was a terrible struggle, but the other succeeded in throwing him and escaping from the room. Upstairs he found a member of the Duma, who still had three cartridges left in his revolver. The two men came out on the landing and looking down saw the great bullet-head of Rasputin ascending the stairs. He was crawling up on all fours like a bear. They withdrew again into the room and saw him stagger to his feet and make for the door into the courtyard. The snow was thick upon the ground and it was dark, but they could see him against the background of snow and the second man fired three shots. Rasputin continued to run a few paces then fell close to the gateway leading into the street. He had been shot through the head. One of the assassins was standing by the body when there came an incessant knocking at the gate... The police had heard the shots and had sent to inquire what was wrong. The body was lying only a few feet from the gate. Boldness was the only course, so the assassin opened the gate and took a high tone with the constable, explaining there had been a dinner party and that one of the guests had fired his revolver at a dog in the courtyard and killed it. The man went off apparently satisfied. There were now several things to do, the body had to be dragged into the house, and a dog had to be killed and laid in its place. My informant was doing this single-handed when he heard voices in the house. The same policeman had been sent back to the front door to make further inquiries. 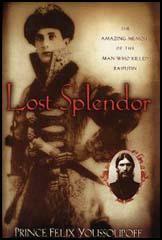 He was questioning the assassin, who had entirely lost his head and had blurted out, "Yes, we have killed Rasputin." My informant stepped boldly into the breach. "Look at him," he said. "The wine has turned his head; when the dog was shot I said what a pity it was not Rasputin, and this friend of mine in his fuddled state has taken it literally and thinks we have done it." As part of the Timewatch production I had the opportunity to interview Professor Zharov about his findings. A short excerpt from the interview is included in the transmitted programme. Three of the questions I asked Zharov and the answers he gave are, I believe, of particular importance. "I wonder if you could give me your opinion about Professor Kosorotov's evidence that the three bullet wounds were caused by different -calibre weapons." "Yes, I think that is the case, if we accept the wound to the left side was caused by a Browning, the one to the back by a Sauaage, and then the one to the forehead was caused by a larger-calibre weapon than both of the other guns." "In your view does the contact wound to the forehead discredit Purishkevich's evidence?" "Of course it does. Purishkevich said he fired at Rasputin from behind at a distance of twenty paces and hit Rasputin in the back of the head. The picture of Kasputin's forehead shows an entry wound; the standsmark around it means it was fired at close range." "In your view, as the forensic evidence tells us that three weapons of different calibre were used, does this mean that there was a third person involved in the shooting?" "As a scientist I cannot say that a third person was involved in Rasputin's murder. What I can say is that as an individual I am certain someone else was involved, because neither Purishkevich nor Yusupov mention the close-quarter shot to the forehead. If they didn't do it, who did?" There is no forensic evidence that Rasputin was poisoned by the use of potassium cyanide (although the Zharov report identifies how the cyanide might have been neutralised). This is the problem of following what Yusupov and Purishkevich reported as fact. At the time of his demise Rasputin was in a state of drunkenness. Rasputin did not die of drowning. 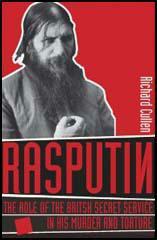 There is evidence that Rasputin was shot three times. All three weapons were fired from a range of no more than 20 centiinetres. All three bullets were from different calibre weapons. It is impossible to know the sequence of the shots but the shot to the forehead would have been immediately disabling and was therefore in all likelihood the last. Both the shot to his left side (stomach/liver) and the one to the right side of his back (kidney) would individually have been fatal in 10-20 minutes.